Build the ‘political will’ and the cycle lanes will come. Riding a bicycle is an extension of walking. Infrastructure, policy and promotion are the key ingredients needed to bring about a city full of bicycles. And a city full of bicycles will bring about better health outcomes, better environmental outcomes, better financial outcomes and better social outcomes. And remember, it’s a city full of wheeled pedestrians that we are trying to create. Daily, ordinary transport journeys. A to B. Short distances. An extension of walking. No sweat. I have argued here before that cycling advocacy is the domain of the current breed of cyclist. Most attention and energy is put into getting the necessary infrastructure built. That is, the building of cycle lanes for cyclists. Meanwhile, the promotional aspects, necessary to influence the people who are not currently cycling, are largely overlooked. But building infrastructure requires a reallocation of space and a range of alternative transport policies. And that will only happen on the back of strong ‘political will’. That key ingredient is lacking at present. So, what is ‘political will’? How would we build it? How would we know if we had it? It’s time to broaden our approach. By turning our attention to building ‘political will’ we may find that there will be less resistance to building cycle lanes or implementing bicycle friendly transport policies. It seems to me that most efforts to create ‘political will’ are focused on trying to directly influence that amorphous blob called the local transport authority. Any necessary foundation work has been neglected. Here’s the scenario. A cyclist dies as a result of a collision with a vehicle. Pockets of moral outrage spring forth from a small bunch of cyclists, pleading and cajoling the authority to make the roads safe for cyclists. ‘There is a mandate for change’, they say. But they aren’t speaking on behalf of all citizens, they are speaking on behalf of cyclists. It’s unhelpful to assume that everyone understands the enormous benefits that cycling brings to a community. And besides, cars are in our DNA. The scales are tipped in favour of driving. There is no way to short circuit the process of change. As we all know, being right is a guarantee of nothing in this world. But even if all the power brokers at the so-called amorphous blob agreed with these cyclists’ sentiments and arguments, the very profound weight of motordom’s cultural legacy would make any significant change nigh impossible. Moral outrage will well and truly be deflected by the time it reaches the inner sanctums of the transport authority. Real public opinion, the stuff you see in the comments section of your local paper, will guarantee significant inaction. The ‘political will’ that is so desperately needed, sits with the people who reside in the city. And at present, most of those people expect to be able drive just as they have always done. 1. Make cycling look normal. And make the living in a city that caters for people ahead of cars look normal. It’s the whole package that needs to be promoted. Those are tasks for experts in marketing, not for avid cyclists. 2. Engage at a community level and start to reframe the debate. Bicycles are just one of the key ingredients in a vibrant, sustainable community. Change will come about as a result of grassroots support. Politicians are emotional beings. They were children once. Growing ‘political will’ in a community setting is a bit like creating a behaviour culture in a classroom. It requires the implementation of a range of complimentary strategies. It is all about defining and selling the merits of the desired behaviour. Identifying those who are already modelling the desired behaviour. Highlighting, celebrating and rewarding that behaviour. Offering encouragement and rewards to those who are willing to adopt the desired behaviour. Establishing and enforcing consequences for not following the desired behaviour. Change is coming. But how do we speed it up? It would be a shame to have to rely on change coming in the form of a black swan moment. Try riding a bicycle in a city that loves its cars this much. Down time at One Tree Hill Domain, Auckland. My trusty companion (aka The Ninja Princess) and I took advantage of the beautiful weekend weather to explore One Tree Hill Domain (Maungakiekie) in central Auckland. It’s a gorgeous park. Full of people, sheep and unfortunately, cars. We also went to check out the planned temporary closure of one of the through roads. It was buzzing. People were lingering. There was entertainment for all ages. Auckland Council should be commended for their efforts. Let’s hope it’s a taster for what could be a permanent thing…the park closed as a through route, that is. Is there not some way that the complete encroachment by motorists of this beautiful park could be slowed or halted? A separated cycle path wouldn’t solve the car problem in this park, but it would extend an invitation to people on bicycles. The narrow road that winds through the park leaves no room for cars travelling in both directions, and for people on bicycles. We really did rely on motorists to slow down and wait before it was safe to do an overtaking manoeuvre. That goodwill was not always forthcoming. The only thing that was slowing down traffic on the day was the over-supply of other motorists. It’s well overdue for this park be turned into a mobility environment that favours active travellers ahead of motorists. There were other people on bicycles in the park but most of them appeared to arrive by car, with their bicycles on the back. Auckland: the bike rack capital of the world. 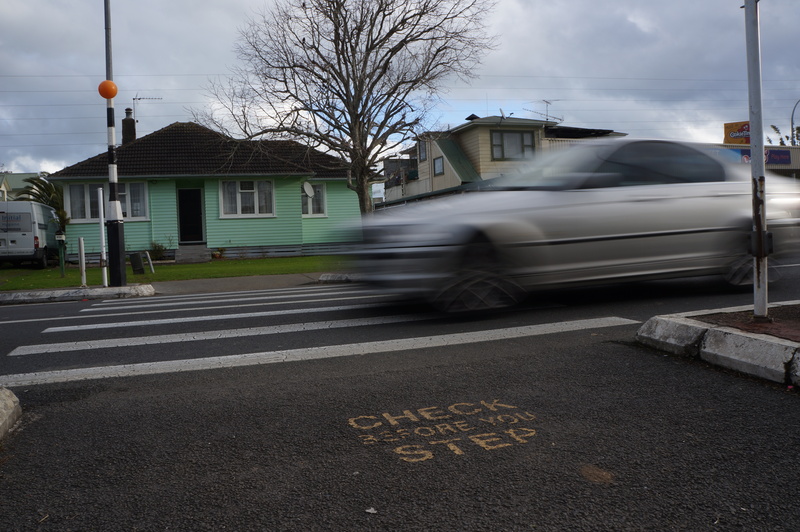 This is a problem that Auckland has so far failed to address. Motorists have been given the keys to the city and they don’t look like they are ready to give them back any time soon. Get involved via: Twitter, Facebook, Flickr, Vine. Vote cycling! 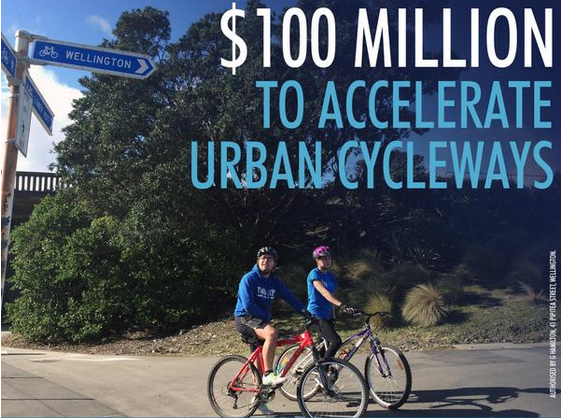 Government to spend $100 mil on urban cycleways. Clearly, no wheeled pedestrian was involved in the design of this image. Anyone else have the feeling that the Government’s announcement to spend $100 mil on urban cycleways was released just a bit earlier than intended? #DirtyPolitics and all that. The money is to be spent over 4 years, throughout New Zealand. To me, it feels like a ploy just to buy some time. Really. I’d take the money though. For sure. But it wouldn’t even come close to covering the marketing budget to give city cycling the credibility it so desperately needs. And was a mode share target attached to this $100 mil? Can’t imagine it. By the way, anyone know how much it costs to 1. remove some on-street parking and 2. narrow some car lanes with a bit of paint? 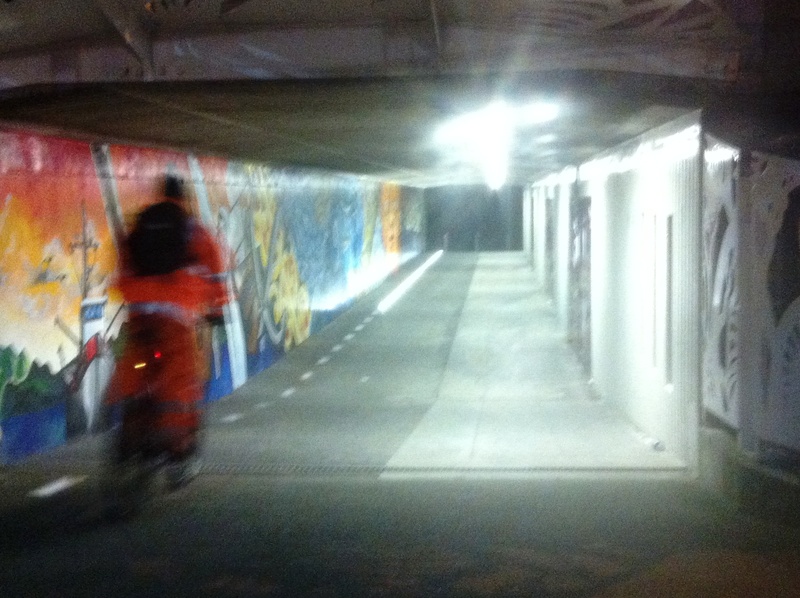 And I wonder if the government’s idea of urban cycleways is the same as mine? Will they incorporate shopping centres and other key destinations? In context of this government’s bid to cure congestion with a massive motorway lolly scramble, this ‘investment’ in urban cycling is a mere drop in the bucket. The PR budget for those motorway projects is way more than this. Because the government can’t just build motorways. It has to sell them first. You know, create the demand for them. 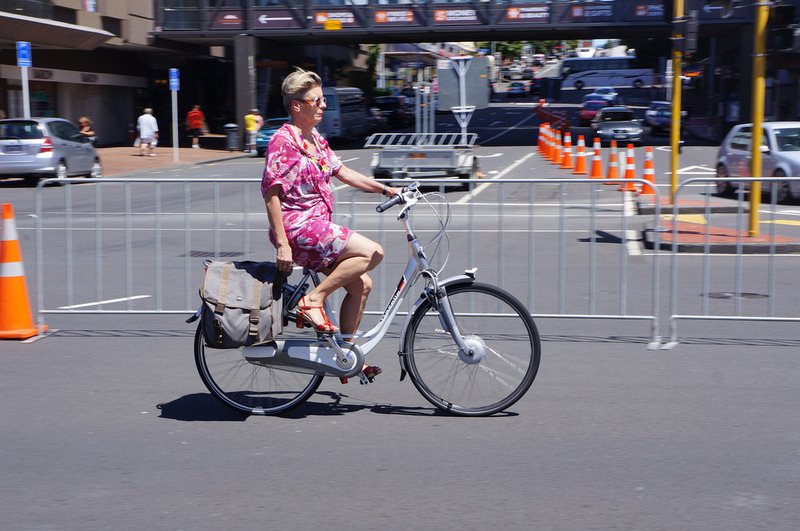 The merits of promoting ‘wheeled pedestrian’ cycling. Promoting an image of cycling that appeals to a wider audience. For me, ‘cycling’ is an activity that is as easy as walking, but faster. Short trips, slow and comfortable. Riding a bicycle. 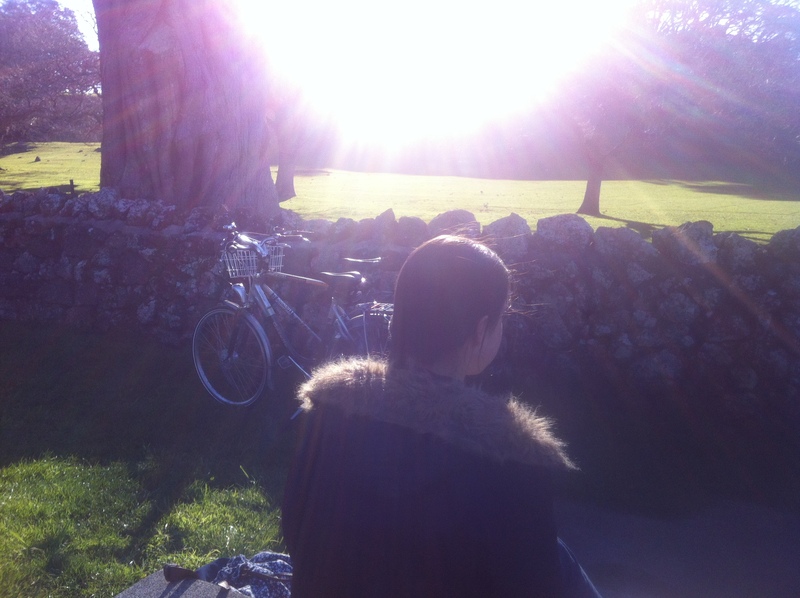 But my image of ‘cycling’ is at odds with the image of cycling that we see all around us. The dominant image of cycling in a non-cyclised city is of sports and recreation, brave and fearless. But thanks to the internet, the way we can now perceive cycling, is changing. Examples of how cities are starting to integrate the bicycle back into city life are only a mouse click away. We can see the bicycle being used as a transport option. As an alternative to the car. For those short, local trips. A viable alternative for young and old, male and female. These international models provide us with real inspirational and aspirational value. So, if we accept the possibility that riding a bicycle can simply be an extension of walking, then we can also accept that it is a relatively safe activity. 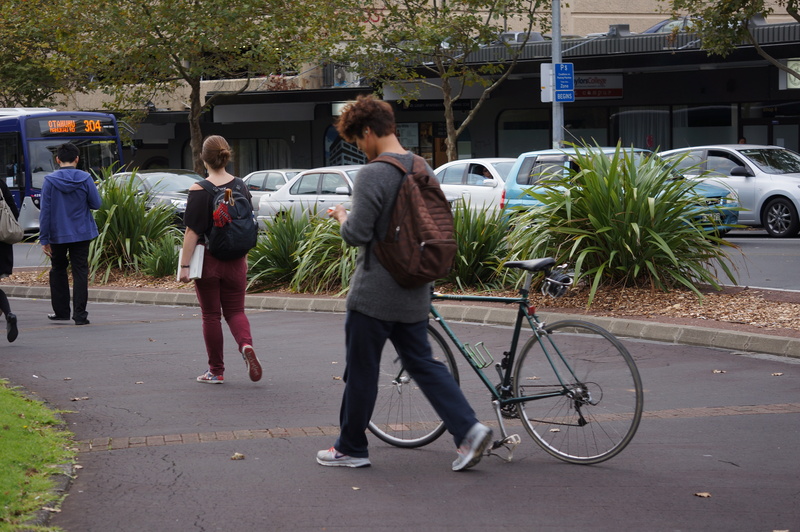 It is the inevitable ‘interactions’ with fast moving traffic that makes moving about our city on foot or on a bicycle less safe and less attractive. So, what can be done to make these ‘interactions’ less inevitable? promoting cycling beyond its current dangerous and sporty image to one that is desirous and normal. Presenting cycling as something that is normal and mainstream is a way of making cycling appeal to a wider audience. And it’s that wider audience that is needed to get the bicycle on to the political agenda, to put pressure on politicians to fund it appropriately. ‘Wheeled Pedestrian’ style of cycling fits the bill. It’s the style of cycling that needs to be promoted. That’s because it’s a type of cycling that the current non-cycling public will most readily identify with. I would go even further and suggest that efforts to normalise cycling is the foundation work to increasing the number of people choosing to ride a bicycle in their daily lives. Because winning hearts and minds will lead to less public resistance in efforts to, among other things, create cycle lanes or implement lower speed limits. This is not a time for avid cyclists to feel snubbed or under appreciated. It’s a practical thing. 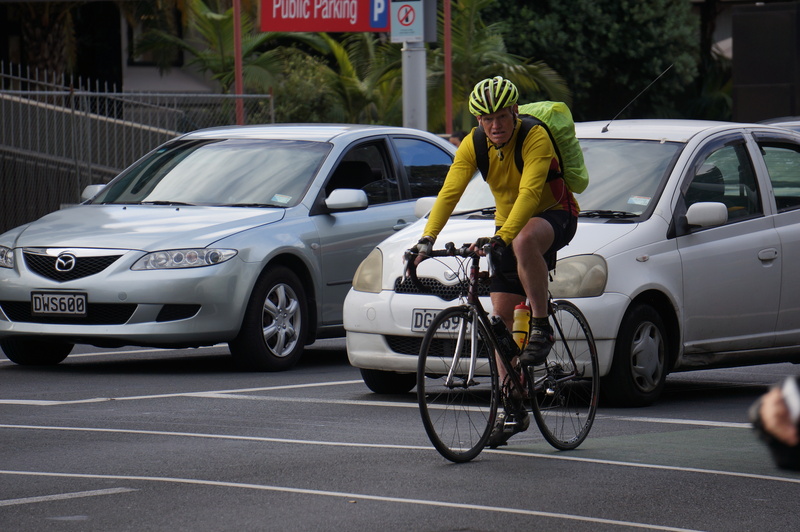 Avid cyclists are not the best people to represent the people who don’t ride bicycles yet. Whether we like it or not, a book is more often than not, judged by its cover. Damn straight – check before you step. 1. A local person reflects on a personal, life threatening encounter with a speeding car and the impact speeding traffic has on their community. 2. The issue is referred to the local transport agency. (Sometimes a community board politician will intervene before referring it to the transport agency). 3. Everything continues as if nothing happened. In the last five years there have been two rear-end crashes recorded close to the crossing. Nobody has been injured in these crashes. There have not been any cases of pedestrians being hit, reported to the Transport Authority. So in effect, the Transport Authority is saying that the lack of a fatality is a sufficient indicator that a road is safe for all road users. Safety is as much about perception as it is about reality. It’s a feeling. Because “cars project an envelope of danger by their very presence”. I think the local citizen who generated this latest tale of road unsafety to the local paper deserves a medal for speaking the truth for us all. I’ve got lots of clients who don’t let their children walk to school because they have to cross here and it’s too dangerous. In the meanwhile, our very own Auckland Transport offers us their Travelwise programme. The one that teaches children how to identify ‘sneaky driveways’ and how to put their helmets on correctly. Sheesh. So, while it is encouraging to see people speak up about these safety issues, it still feels like there is a long way to go before we will see some systemic change. The people who are questioning the status-quo need to be reassured that their instincts are correct. Priority on our streets has been given over to moving mass volumes of vehicles at high speed. We live in communities that are dominated by cars, at the expense of people. And it’s the people at the extreme ends of the 8-80 age group that are the most vulnerable. Transport inequality. Needless to say, it’s not only cyclists who will benefit when a city manages to deal with its car addiction. The next step is to build a united voice of advocacy; to question and challenge, to provoke change amongst the decision makers. That would be fun.